This project has been funded by the State of Michigan. The Office of Design and Construction, of the State’s Department of Management and Budget is responsible for administering the state capital outlay program and in conjunction with the U of M Architecture, Engineering and Construction is managing the design and construction for this project. The Mason Hall and Haven Hall Addition and Renovation project involves an eight story addition to Haven Hall and renovation of interior spaces. The existing main entry to the building will be demolished and the addition will extend to the south end of Mason Hall. The total area of the two buildings, including the addition to Haven Hall, will be 213,000 gross square feet. Haven Hall will have entirely new mechanical, electrical, and telecommunications systems and among other improvements to Mason Hall all the classrooms will be air conditioned. Haven Hall will house new office space for History, Political Science, American Culture, and Center for African and Afro-American Studies. The ground floor will contain the Main Lobby, a place for student tables, and offices for Services for Students with Disabilities as well as libraries for CAAS and American Culture. 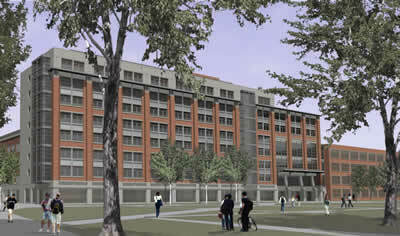 Completion of Haven Hall is expected in November 2002 and the Mason Hall renovation will be phased construction with completion expected in June 2003.